Gary and Karen Thompson in their renovated Fort Thomas home. Photo by JDB Photography. 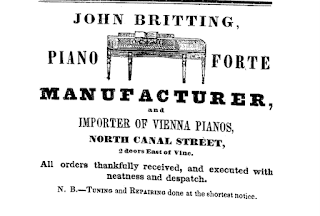 In 1834 someone purchased a piano from John Britting, a piano manufacturer on North Canal street in Cincinnati. Fast forward 145 years, to 1979. Gary and Karen Thompson bid on—and won—the piano at an auction at Tower Park Mess Hall. Only catch? All items had to be removed from the Mess Hall that day. 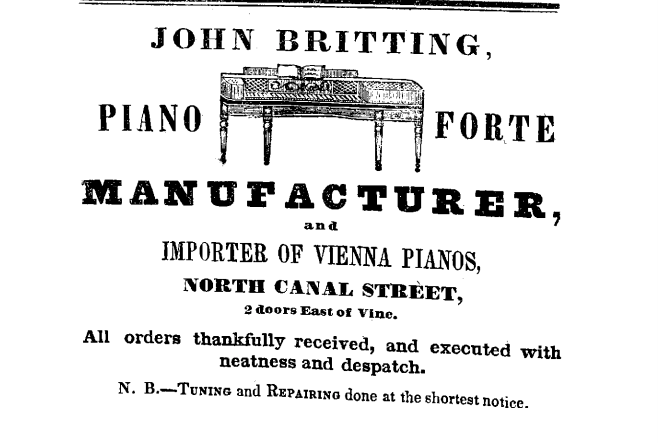 In the 19th century, square grand pianos were in vogue. Elaborate and ornate, large and heavy, the pianos were difficult to move. The Britting the Thompsons won was no exception. Always up for a challenge, Gary simply contacted the guys on his softball team. They showed up and, together, carried the piano out. Little did the Thompsons know that 36 years later their beloved piano would see new life as a kitchen island, which would be featured in the October 2015 issue of This Old House magazine. Gary grew up in Fort Thomas and is a 1974 Highlands High School graduate. He met Karen, who grew up in Southgate, at Northern Kentucky University. The two married, had three children and lived in several homes in Fort Thomas until Gary, then an executive with Cigna Health Insurance, was relocated in 1996. The piano stayed with the Thompsons through many moves and many states. Karen, who majored in music and gave piano lessons out of her home, had two other working pianos. The Britting, which didn't work, was either used as a piece of furniture (lovely decorated at Christmas) or put in storage, depending on the size of the house. Enter the house they're in today. Built in 1959, Gary's parents purchased the house in 1981, downsizing after their children had grown and moved out. Thirty-three years later, July 2014, Gary's mother, Jane Thompson, moved to Barrington of Fort Thomas. Gary and Karen, at this point retired, moved back to Fort Thomas and bought the house. View of kitchen from dining room before demolition. Originally very compartmentalized, the Thompsons gutted the house. For 15 months they've been involved in demolition, building new walls, stripping wallpaper, installing kitchen cabinets, painting and building trim. Many days Gary can be found in his driveway, tools pulled out of the garage, working on a project whether it be a built-in wall cabinet, an antique mantel cut in half and extended or pocket doors for the master bath. It's a work in progress, but work they love. The Thompsons have spent 15 months renovating their home. Having flipped houses in the past, and lovers of HGTV and This Old House magazine, the Thompsons had a vision for their new-to-them home. Ninety percent of the work they've done has been their own, including installing the kitchen cabinets and backsplash. Kitchen design help came from Designer Ally Custom Cabinetry. 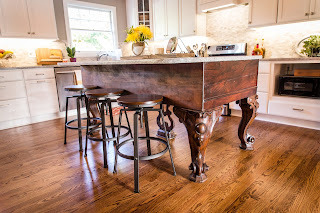 Initially the Thompsons planned for a typical kitchen island until one evening, Karen had an epiphany—couldn't they turn their beloved Britting into an island? Both Ally and Gary thought it was much too large. A couple measurements and one cardboard template later, everyone agreed it would work. The remodeled kitchen includes a seamless mix of new and original hardwood floors. Photo by JDB Photography. Gary dismantled the piano, saving the keys and soundboard for future projects. Ohio Valley Solid Surface installed the huge slab of granite on top. "They had a blast," Gary says. The Thompsons worked on their home July through November and moved into the house December 1, with no kitchen. For seven weeks they made do with a microwave, toaster and electric skillet. They washed dishes in the basement. They talk almost cheerfully about this time, reminiscing about how they even offered to host Christmas dinner for their children and their families—and pulled it off. Still, they have more work to do. Currently the house is one bedroom, with a master suite featuring a gorgeously tiled master bath, powder room and walk-in closet. The Thompsons plan to finish the basement, adding a family/theater room and three bedrooms. Once complete, the house will offer 3,900 square feet of living space. Although the house keeps them busy, the Thompsons make time for family, including their grandchildren. Gary also visits Haiti fairly often with Nehemiah Vision Ministries. Karen still plays the piano, although her husband says not nearly enough. I ask if this is their forever home. "This is not the end," Gary says. 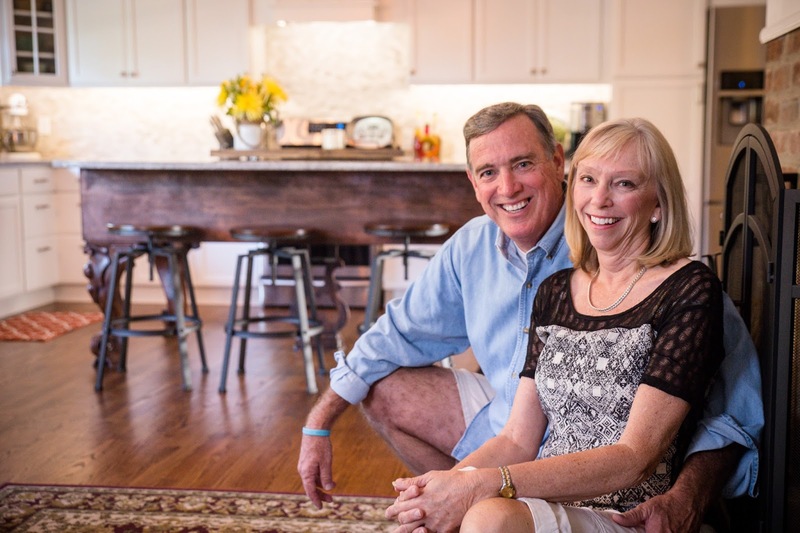 "We have a passion for revitalizing homes, to bring them back to life," Gary says. "You can do anything if you have the right vision." Including turning a beloved 181-year-old square grand piano into a one-of-a-kind conversation piece, the focal point of a home's kitchen.